We address the problem of wide-baseline registration of RGB-D data, such as photo-textured laser scans without any artificial targets or prediction on the relative motion. Our approach allows to fully automatically register scans taken in GPS-denied environments such as urban canyon, industrial facilities or even indoors. We build upon image features which are plenty, localized well and much more discriminative than geometry features; however, they suffer from viewpoint distortions and request for normalization. We utilize the principle of salient directions present in the geometry and propose to extract (several) directions from the distribution of surface normals or other cues such as observable symmetries. Compared to previous work we pose no requirements on the scanned scene (like containing large textured planes) and can handle arbitrary surface shapes. Rendering the whole scene from these repeatable directions using an orthographic camera generates textures which are identical up to 2D similarity transformations. This ambiguity is naturally handled by 2D features and allows to find stable correspondences among scans. For geometric pose estimation from tentative matches we propose a fast and robust 2 point sample consensus scheme integrating an early rejection phase. We evaluate our approach on different challenging real world scenes. 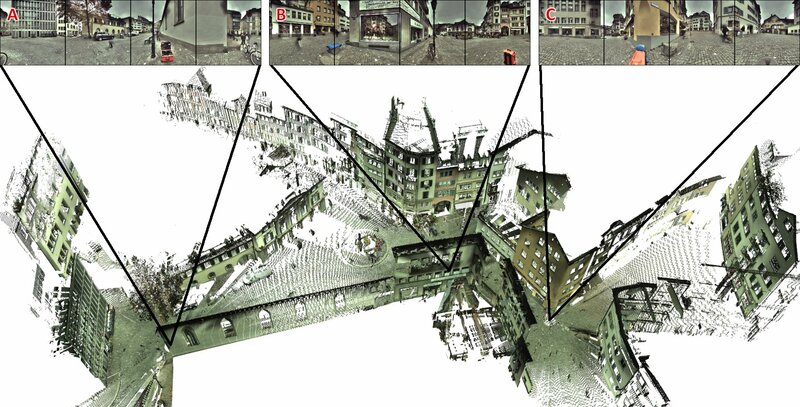 Full dataset (~800 MB) for the CASTLE and CITY scene each containing (i) the original scans, (ii) a RGBD cube-map representation of each scan including needed intrisic and extrinsic camera paramters and (iii) our registration result of the scene. Due to licencing issues we are not able to provide the CHURCH data set yet, but we are working on it. A minimalistic script readMatrix.m to read the binary depthmap files into Matlab.